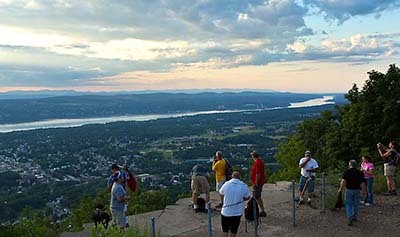 Standing atop either peak provides stunning vantage points out over West Point and the Hudson River, so it was of key strategic importance during the American Revolution. In fact, General Washington’s headquarters were just over the river at what has since become the nation’s first publicly owned historic site. During the conflict, signal fires on the mountain gave it — as well as the nearby city — the name of Beacon. In 1901, the Daughters of the American Revolution honored the role it played in the defense of the young republic by erecting a monument at the site of the original signal fire near the summit of North Beacon. Nowadays, Mt. Beacon is rarely used for sending messages to Continental forces, but it can be the site of some fantastic day hikes, especially if you don’t mind working up a bit of a sweat. 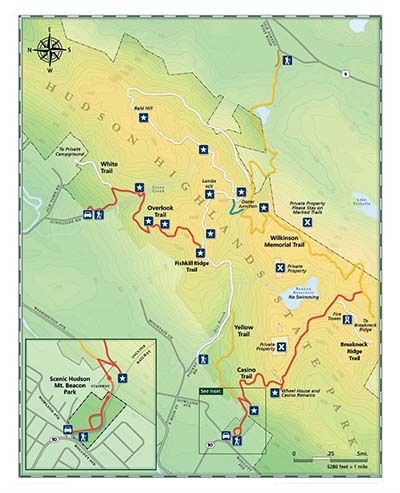 The best and most popular way up is the 8.5-mile loop trail that starts near Beacon, NY. It’s moderately trafficked, so you’ll likely be able to rely on other hikers to provide a helping hand if necessary without having to worry about large crowds. With beautiful wild flowers in abundance along the trail, it really is a sight to behold, but the biggest draw is the view you’ll find at the summit. Don’t be tempted to turn back when you’ve only just begun; the loop trail kicks off with a steady, steep climb of 1,000 feet of elevation over the first mile along. Pace yourself to make sure you don’t burn out, and keep in mind that the rest of the hike will be far more forgiving to the legs and lungs. Once you get up to the top, hang out at the base of the fire tower, which makes an excellent picnic spot, and enjoy the sweeping panorama surrounding you. If you don’t mind starting or finishing with the help of a flashlight, Mt. Beacon is a stunning point from which to take in the sunrise or sunset, and you can even spy the New York City skyline on a clear day. If you’d like to get some exercise, feel the country air in your lungs, and enjoy scenic views, Mt. Beacon is well worth your time. Once you’ve clambered back into your car, try hitting one of the restaurants along the Newburgh waterfront for a well-earned meal.